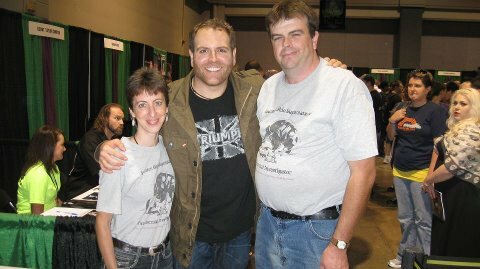 Myself & John with Josh Gates from Destination Truth. I'm Marsha. Together my husband John & my son Matt, we founded Southern Ohio Supernatural. I have spent a life time seeing, & sensing the paranormal. I also had UFO encounters growing up as well as an encounter with Sasquatch. For three years we also lived in a Sasquatch hot spot where our entire family heard frequent sounds from them. I grew up feeling an outcast because of what I could see, hear, feel, or sense that others could not. At first I questioned this, but I have come to find that it's a gift. A gift filled with both good & negative rewards. I focus on the good, which is being able to help others. I enjoy helping others, as well as helping any spirits that have not been able to move on. This is why we founded (S.O.S.) Southern Ohio Supernatural . I am blessed to be sharing this group with my wonderful husband (John), & our talented son (Matt). While we still do some & also still doing lecture events, we have had to slow down on doing investigations as we have discovered that all of our kids & I have a hereditary disorder called Ehler's Danlos Syndrome which has been causing a lot of health issues including many secondary disorders such as Postural Orthostatic Tachycardia Syndrome (POTS), & Mast Cell Activation Syndrome (MCAS) to name a few. These disorders are commonly misdiagnosed, misunderstood, & not well known so spreading awareness is crucial. Myself & Marsha with Ghost Hunters International. I'm John. From a long time back, I can remember seeing things I didn't know how to explain. That figure out of the corner of my eye, that shadow that seemed to move on it's own, that weird light, that darted across the sky. For a while I wondered why, why do I have to see this? But now I'm glad I do. I wouldn't trade it for the world, knowing I may be able to both help people with their paranormal occurrences, and the thrill of finding out something new about the unexplained (I tend to get like a kid in a candy store). I'm glad to be on this team with my family. I'm Matt. 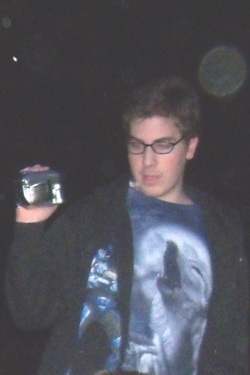 I am now 24 years old & have grown up with the paranormal as well. Seeing ghost & other spirits have been the normal for me. I was honored to have almost been on the show Psychic kids from A&E. After packing bags, the show was canceled at the last moment & I was passed over for the next season so that they could choose someone that was truly afraid of their experiences. I enjoy helping others with their paranormal problems, talking with my friends, being outdoors, & playing video games in my spare time. Newspaper article about our team while at the Camden,Ohio Public Library on Oct. 2012. We were very suprised & honored to be in this & appreciate such great support from the Preble County area. Would you like to be on our team? 1. You have a heart for helping people & earth bond spirits, not interested in doing it for fame, fortune, or adrenaline rush. 3. Open minded, polite, mannerly, caring, & considerate of all beliefs & religions. 4. Willing to follow directions. Please note; We are a family based team, our cases are "as needed". This means that some months we may not have any cases, while other months we may have several. If this sounds like something that you would be interested in, please contact us & let us know. We are not accepting additional members at this time.